Here’s a brand who’s products I have yet to get my hands on; Cake Beauty products are known for being a decadent alternative to normal body and hair products. They use healthy, natural ingredients in their products, which are not only meant to make you smell good, but also to help you feel good–according to their website. For a limited time, get 40% off regular priced items online. The discounts are already listed on the site and will be applied automatically to your cart. 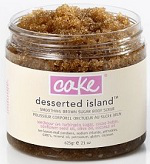 One of the items on my wish list is the ‘It’s a slice body scrub’; which is made from brown sugar and has hints of orange and vanilla. It’s usually $32.00 but with the discount, it drops down to $19.20. Another one on my hit list are the dry shampoos that they carry; they are more effective and not as expensive as their major brand counterparts. They are designed to soak up the oil in your hair so you can snooze that much more in the morning. Shipping is a flat rate of $9.99 for this delicious company.